Royal Air Force Charitable Trust Enterprises - News: Danish Confirmation! Home » The Airshow » Visiting the Show » Latest News » News: Danish Confirmation! The Royal Danish Air Force has confirmed its participation in the Air Tattoo, kicking off the first of our static aircraft line up. An EH-101 Merlin from 722 Squadron based at Karup Air Station will fly to RAF Fairford to feature in the Air Tattoo. 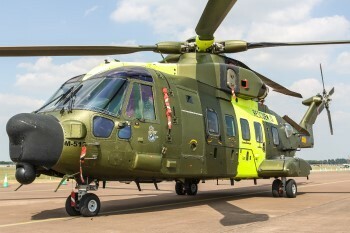 The EH-101, manufactured by Leonardo Helicopters in Yeovil, Somerset, is used by the Royal Danish Air Force (RDAF) for tactical troop transport and search and rescue duties. The RDAF are strong supporters of the Air Tattoo having previously sent aircraft including the F-16, C-130 Hercules and Challenger CL-604.